Whether you’re a Lafayette, IN homeowner that needs to clean and freshen up your living space or if you’re expecting guests for the weekend, you can count on Chem-Dry of Lafayette for professional carpet cleaning with minimal downtime. Competitors in the area use cleaning solutions that only touch the surface of your carpets, and can potentially leave you with long dry times. Our Hot Carbonating Extraction™ process deeply cleans and has quick dry times to ensure a thorough service. Minimal downtime. Our proprietary HCE process dries much faster than other carpet cleaning methods in the Lafayette area. Significant reduction of allergens and mold. Leaves no sticky or dirt-attracting residue. Our techniques allow us to lift the pile of your carpets and clean deep, revamping the overall appearance of the carpet fibers and complying with warranty-approved methods from the major carpet mills. Our gentle agitation of your carpets is enough to clean deep with the microscopic carbonating bubbles, but is still safe for the carpets. Chem-Dry of Lafayette has received the coveted seal of approval from The Carpet And Rug Institute! This means we meet high cleaning standards in the following areas: soil removal, water recovery, fiber protection and cleaning solution certification. The CRI seal of approval serves as proof of the high-quality cleaning services we provide and guarantees that you are receiving a proven service that works. Whether you’re a West Lafayette homeowner that needs to clean and freshen up your living space or if you’re expecting guests for the weekend, you can count on Chem-Dry of Lafayette for professional cleaning with minimal downtime. 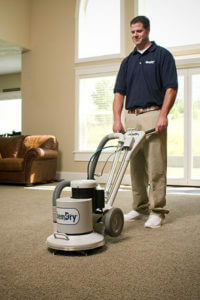 Our competitors in the area use cleaning solutions that only touch the surface of your carpets. Our Hot Carbonating Extraction™ process deep cleans to ensure a thorough service. Minimal downtime. Our proprietary HCE process dries much faster than other carpet cleaning methods.